The Premises Studios, a world famous recording and rehearsal studio in Hackney are delighted to announce that they are starting a new series of workshops for young people aged 13-19. Starting on October 1st 2011 the Lottery funded workshops will give young people the chance to work with one of the UK’s most dynamic Choir Directors, Clive Brown. 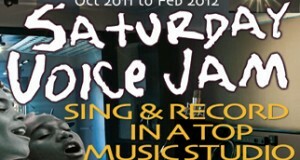 Each week at the Saturday Voice Jams a choir will be formed from scratch and attendees will learn singing, performance techniques, harmonies, team work and many other musical skills. They will also take part in recording sessions and will have a fantastic opportunity to perform in a gala concert at the Hackney Empire. The studios are also offering the opportunity for participants to study for an Arts Award as part of the course, a valuable new national qualification. There are outreach sessions in local schools throughout September where young people will be given a taster of what to expect as part of the Saturday Voice Jams.